We’d just spent about 3 weeks in Colorado, and as much as we loved it, I was ready to get another state border crossing under my belt. The border of Wyoming was only about 4 hours away, so we packed up early that morning and headed out. 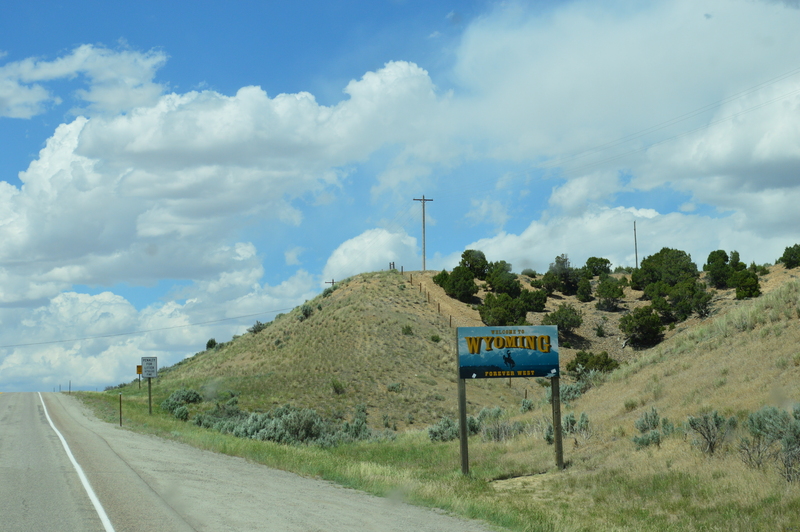 After a few hours of more Colorado loveliness, we crossed into Wyoming. The landscape changed from lush green mountains and snow covered peaks, to rocky craginess and lots of brown. “This isn’t what we were expecting!” we kept saying. We also were dealing with 35+ mph gusts which were blowing us all over the road. And just to make it more fun, a caravan of wide load semis was passing us in the other direction. “This better be worth it” was muttered more than once. Or original plan was to spend the night somewhere easy and cheap in Rock Springs WY. But when we got there, Deas had the itch to keep going, so keep going we did. After a couple of weeks of RV park camping, we were really hoping to find a boondocking spot. I was trying to research spots on the computer while we were driving, but we were in the middle of nowhere and had very spotty cell service. This was beginning to be one of those times when not planning ahead wasn’t such a good idea… But then I finally found a spot that looked ideal….the Warren Bridge campground, a BLM campground on the Green River that was right off the highway, had nice big pull through spaces, and only cost $10. In fact it looked so perfect we were worried it would be full. But our worries were for naught…we pulled in to find that only 3 of the 14 available spaces were taken. As we pulled into our sight, Glyn, the nicest camp host I’ve ever met, came over and greeted us with a cowboy hat and a smile. 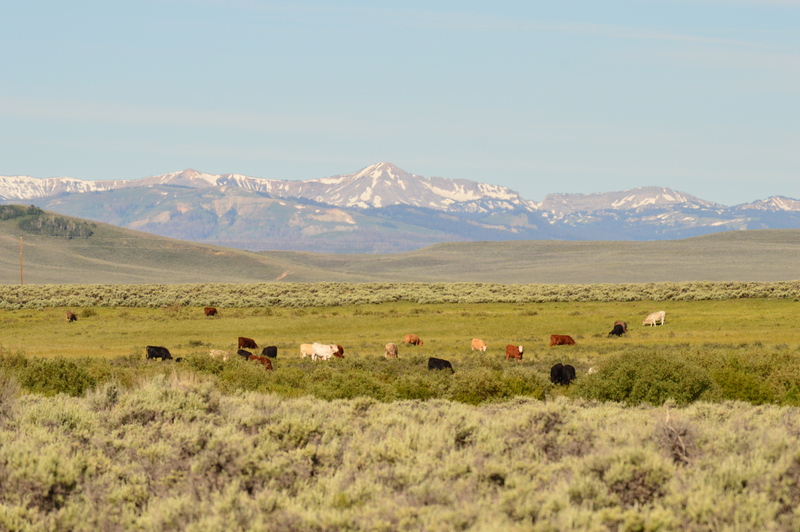 Our site is right on the river with a view towards the Wyoming Range mountains, and a huge pasture full of cows. (What is it with cows and campsites all of a sudden??) There’s an osprey nest about 100 feet from our RV, and the other RVers even reported seeing two moose in the field with the cows. Icing on the cake – a full 4G Verizon signal. And did I mention it’s only $10??? Deas cooked up a roaring fire and we had hamburgers over the grill for dinner and watched the supermoon rise in the sky. Glyn mentioned to Deas that he is also a minister, and that he holds a casual church service outside his RV every Sunday at 10:00, and that we were welcome to join. Deas and I have not been very good about going to church the past several years (sorry, Dad), so we decided to attend. We met Glyn’s wife Diane, and a couple that lives across the street who are friends with Glyn and Diane. Glyn is a very humble guy, and didn’t really preach as much as just lead a discussion with us. 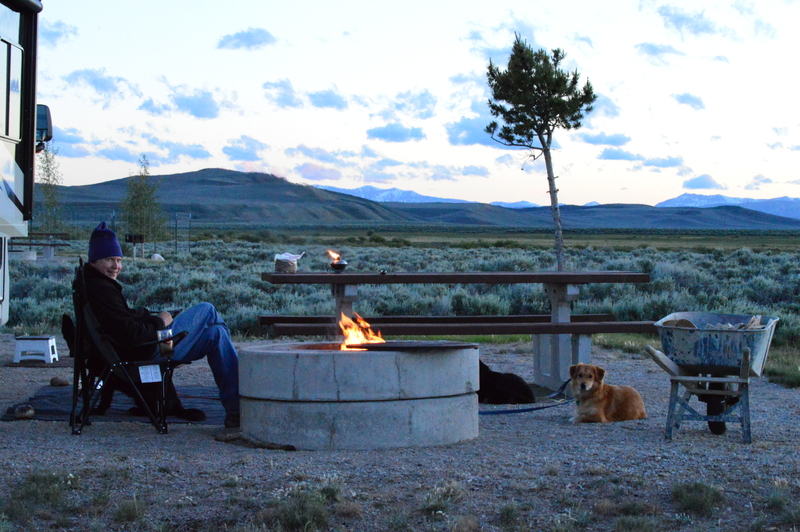 Sitting outside in the cool Wyoming air, it was a very peaceful and enjoyable experience. And then we walked back to the RV. I opened the door, and were smacked in the face with a horrible, disgusting aroma. The kind of smell any dog owner knows and fears. Nikki, our 65 pound German Shepherd, had apparently eaten something that didn’t agree with her. And the evidence was all over the floor. G-R-O-S-S. Life with dogs…. What an amazing looking site…with 4G!!!! I hope feels better soon. 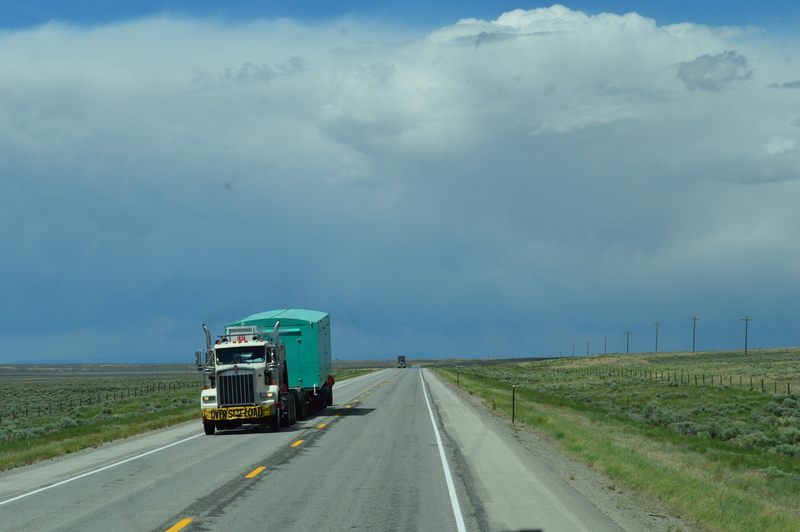 We well remember the wide open spaces of Wyoming, the winds, and the semis with big loads … mostly those huge wind mill propellers. And this was on our maiden voyage bringing the motorhome to Virginia from Oregon. It was a great trip. 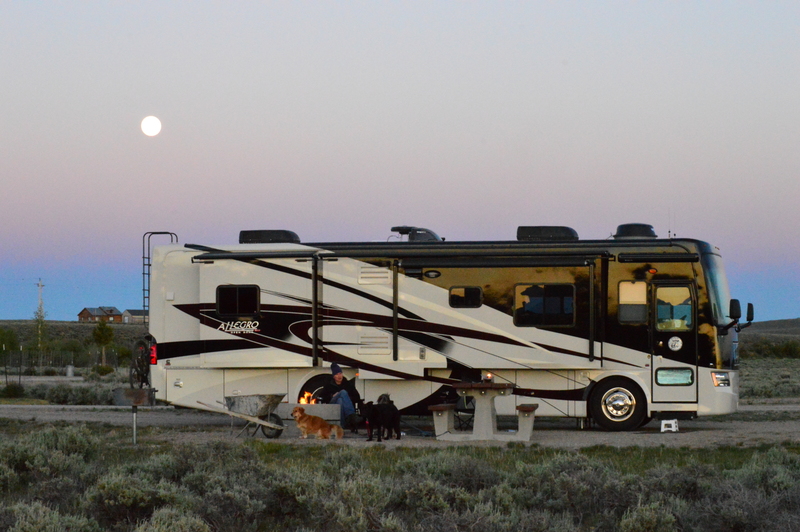 You sure landed at a great campground … and with 4G to boot … sounds like our kind of boondocking site. A maiden voyage with winds like that – I can’t imagine! We were definitely happy when it was over. Beautiful! I want to explore wyoming so badly! Keep on taking photos and blogging….hope you guys are having a blast 🙂 I drove 758 miles from El Paso to Houston yesterday. Sadly my 3 week road trip ends on friday. We were going to stay near Pinedale/Boulder Wyoming on our way up to Montana, but we might try this campground. It will finally give me a chance to test out my Yamaha 2000 watt propane generator. 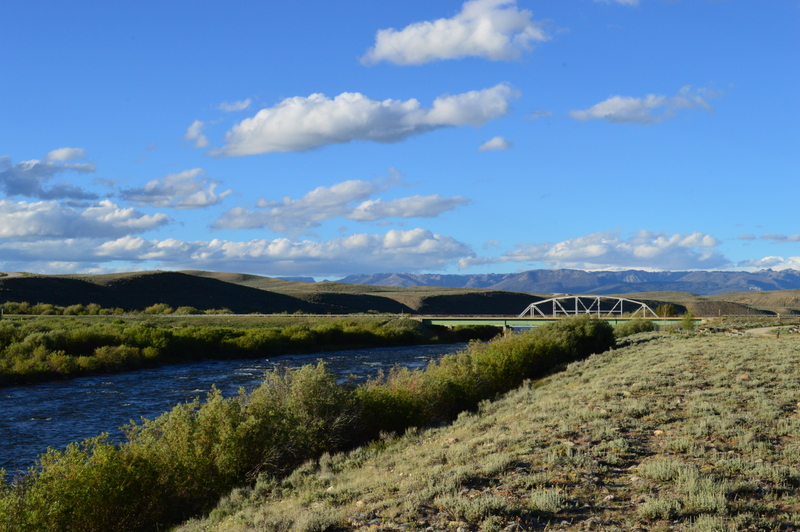 We drove through Pinedale – it didn’t look too exciting. I would definitely stay here over Pinedale. Also, there is free BLM camping on the road right across the highway from where we stayed. We didn’t realize that until we were already set up. Deas rode his bike down that road and said there were some great sites there too. Next Next post: Elk Encounter!